A good event photographer knows that taking beautiful detail photos is vital to complete coverage, and this event at the Beverly Wilshire Hotel provided such a wide range of decor and lighting challenges that we had to work very hard to make sure everything was captured perfectly. 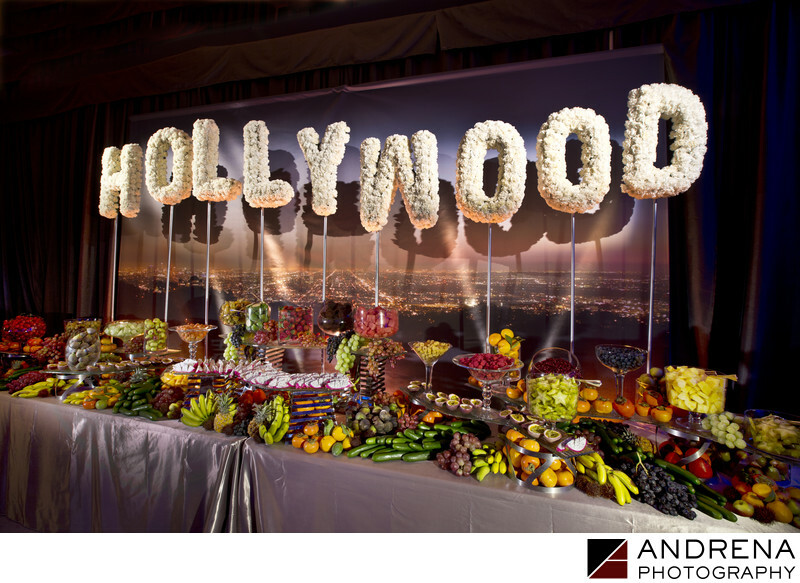 For this photo of a fruit display topped with flowers spelling out Hollywood, we used two lights to ensure that we could bring in a nice range of modeling in the light pattern. If we had photographed this table without adding light, there would have been an unsightly hot spot in the middle of the Hollywood display, and the rest of the letters would have fallen into darkness. Shooting important details like this involves planning as well as use of a tripod and multiple lights.